"This quick, colourful and nutritious weeknight dinner is a great way to encourage your family to eat more fish." Blend Spreadables butter with chives, parsley, lemon juice, lemon zest, garlic, and mustard until well combined; set aside. Lay 4 large sheets of parchment on a work surface. Mound an equal portion of the zucchini, red pepper, and carrot in center of each sheet. Sprinkle evenly with half each salt and pepper. Top vegetables with a piece of cod. Sprinkle evenly with remaining salt and pepper. 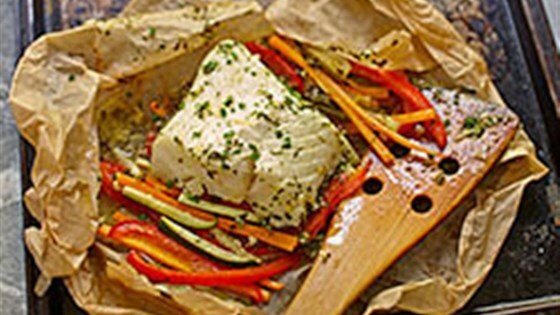 Dollop butter mixture evenly over fish and vegetables. Seal packets by bringing up the sides and folding down tightly. Fold under ends tightly. Transfer to a large, rimmed baking sheet. Bake for 20 minutes. Let rest for 5 minutes; carefully open packets to serve. Packets can be assembled ahead and held for up to 8 hours in the refrigerator before baking. Buttered foil can be used instead of parchment paper. Haddock, Alaskan pollock or Pacific halibut can be used instead of cod. Serve with buttered, steamed brown or white rice to complete the meal.